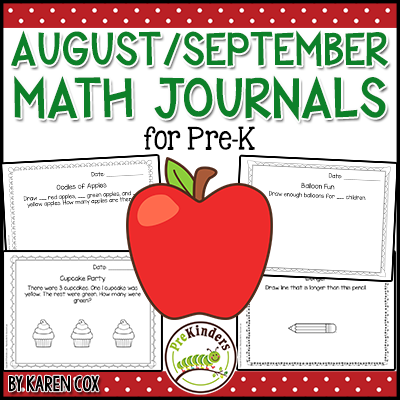 Pre-K & Preschool activities for the first days of school. In the beginning of the year, we spend a lot of time talking about rules and practicing rules. Our lessons and activities are centered around learning the rules and procedures of the classroom, but the children are having fun at the same time. 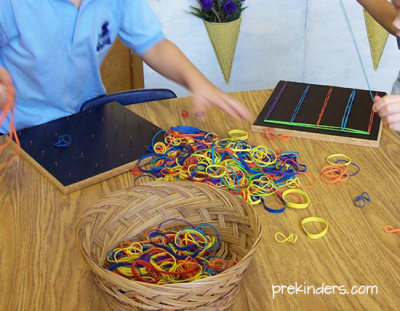 Children learn how to organize the classroom, putting things back where they go. 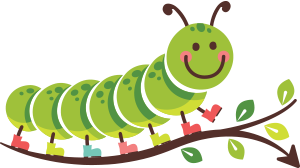 Everything in our classroom has a place, and it stays in the same place all year, so that children can find things and put them away more easily. 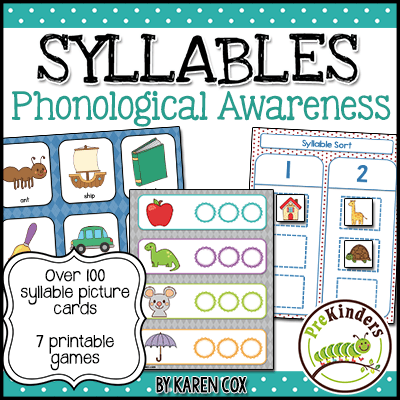 During the first few weeks of school, children explore almost all of the main materials in our classroom while learning rules for using them. 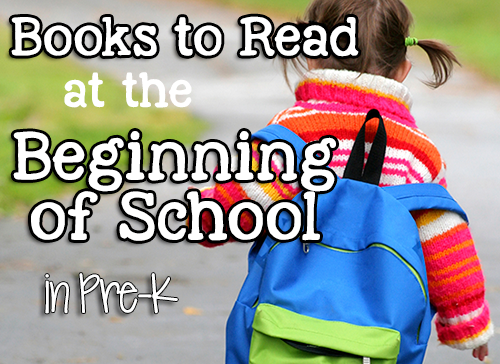 Read more about the first days of Pre-K.
Click here for a complete list of Beginning of School books! 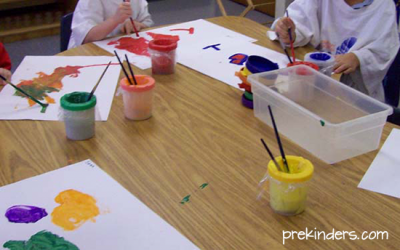 Children paint using a water cup and water color paint set. 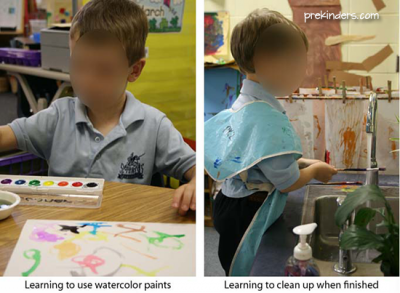 The children learn how to wet the brush and the paint, and clean the brush in the water cup before getting a new color. They learn to wash their brush at the sink before storing it in the paint box. We use the tempera paint cups (which are available in the art center every day). We discuss rules for painting and cleaning up. 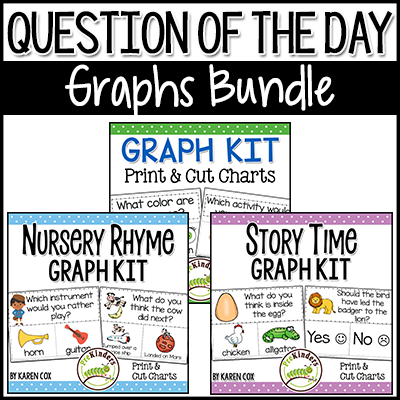 Children explore with dry erase boards. 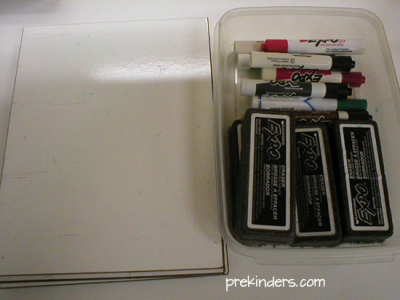 They learn procedures for using the markers and cleaning and storing the lap boards. 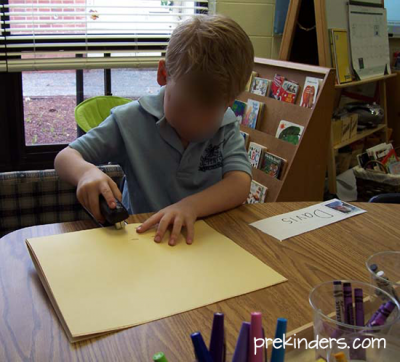 Children learn how to make a book with colored or white paper and a stapler. They draw pictures on the pages. Many children make their own books in the Writing Center during the year once they learn how. 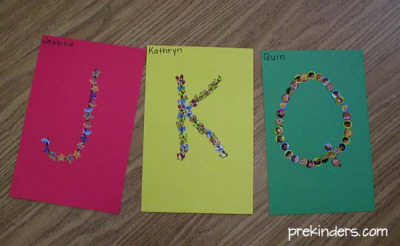 Children stick mini stickers on the first letter of their name. 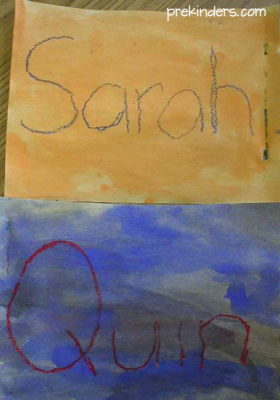 Children trace over their name with an oil pastel crayon then paint over the paper with water color paint. The waxy crayon resists the paint, so that the name shows through. Children string fruit loops onto a piece of yarn to make a necklace. We do this on the first day of school because it is an early dismissal day and lunch is not served that day. This gives them a snack if they are hungry. Children play with play-dough and cookie cutters. 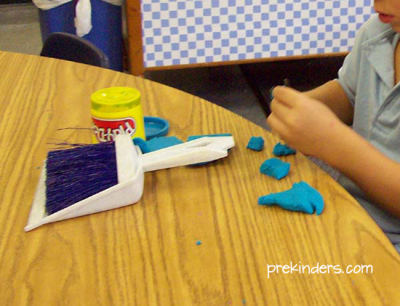 We discuss rules for using play-dough, cleaning up and storing materials. To clean up, children separate play-dough tools and cookie cutters into containers. There are hand brooms for the children to sweep play-dough bits from the floor and table. 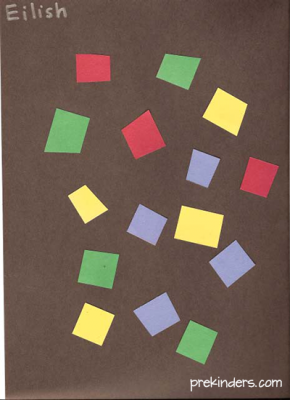 Children use 1-inch strips of colored paper, cut them into small squares, and glue them on black paper to make a Mosaic. We talk about safety rules for using scissors and how to use glue. 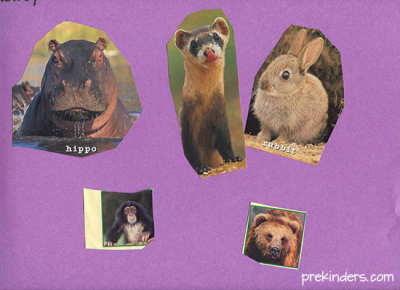 Children cut out pictures from magazines and glue them on paper. We review scissor safety rules. We practice putting simple wooden puzzles together, emphasizing that all pieces must be put in the puzzle correctly before storing it. 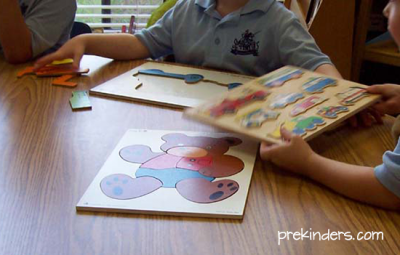 Children explore with geoboards, and other basic math materials, such as pattern blocks, Unifix cubes, bear counters, etc. This is a very simple cooking activity for the first days of school. 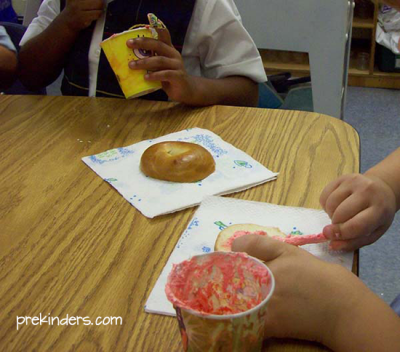 Children mix food coloring in white icing, spread the icing on graham crackers or a bagel half and add sprinkles. 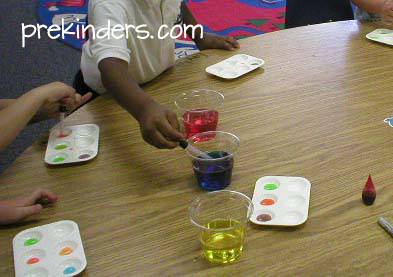 Children experiment with mixing colored water. We use the primary colors (red, blue, yellow) to make new colors. We use paint trays with 6 small bowls to mix the colored water in and eye droppers. Children can dump their water into a bucket once they have filled the 6 bowls and start again. Read the post about Friend Bingo. This is a game that helps children learn their classmates’ names. 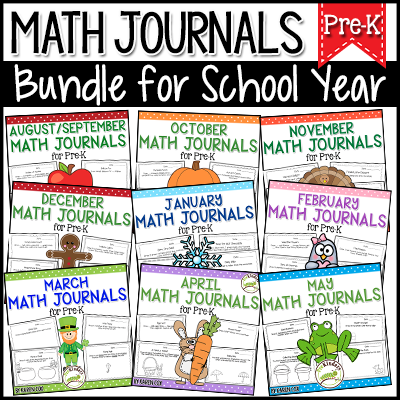 You might like these Pre-K Math Journals for August/September (Back to School), available in my shop.